PLEASANT VALLEY: THAT ALL MAY COME, SERVING THE PEOPLE OF GOD! 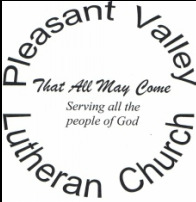 Welcome to Pleasant Valley Lutheran Church! Thank you for stopping by. Be sure to check us out on Facebook! Weekly Worship: Every Sunday at 9:00 a.m. with fellowship following at 10:00. Miss a Sunday? Want to learn more about Pleasant Valley? Be sure to follow us on Facebook! AUDIO RECORDING OF SERMONS NOW AVAILABLE. Go to SOUNDCLOUD to learn more and listen today! Sunday School is back in session starting September 9th! We are using the Whirl program from Augsburg Fortress. Check it out HERE! We meet Sunday mornings at 10:15am. Confirmation: Meets Sunday mornings starting with worship at 9am for all 7th and 8th graders from Labor Day to Memorial Day. Contact Pr. JonPaul for more information. We hope you will make the effort to find us by using the small map provided. You may click on the map to get directions.